Cattus Island County Park and the Cooper Environmental Center is OPEN. Please come and visit the newly renovated building with brand new exhibits highlighting the natural beauty of the park and the Barnegat Bay! The Wheel Chair accessible 1000ft ADA Boardwalk is complete and now open. 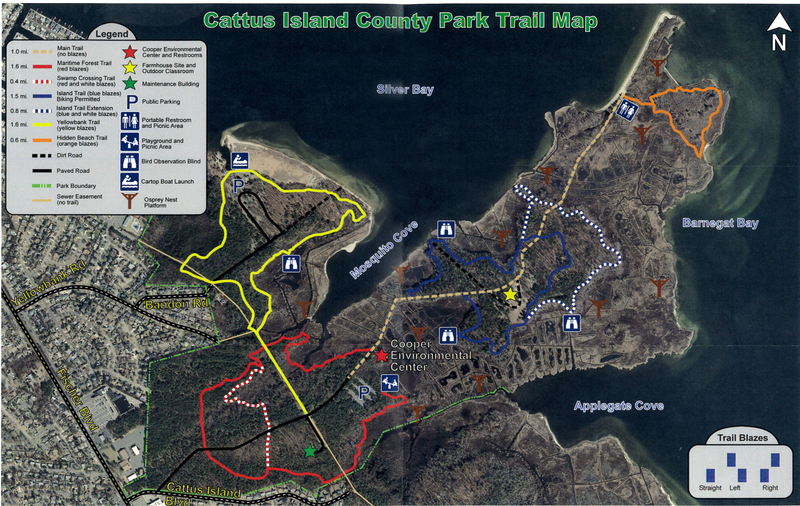 Take in the unspoiled beauty of Cattus Island County Park, which spans 530 acres and 7 miles of trails. Take a leisurely walk along the main trail to the beach, or walk a trail and enjoy many lovely vistas of Barnegat Bay. Cattus Island is home to the newly renovated Cooper Environmental Center where visitors of all ages will enjoy hands-on educational displays such as, a live view osprey cam, habitat tree and tunnel, bird viewing area, children's activity corner and a spectacular collections of live reptiles and fish. The park also contains a beautiful Butterfly Garden where you can view native plants and pollinators. Nature trails, scenic boardwalks, birding, photography, conservation area, environmental education, cross-country skiing, picnic area, playground, scenic overlooks, and accessible environmental center with restrooms. For more information, call 732-270-6960.